The space shuttle Endeavour stands atop Pad 39A before sunrise at NASA's Kennedy Space Center on June 13, 2009. NASA postponed the shuttle's planned 7:17 a.m. EDT launch due to a gas leak on the pad. Thisstory was updated at 10:00 a.m. EDT. CAPECANAVERAL, Fla. -- The space shuttle Endeavour and its seven-astronaut crewwill have to wait through at least four days of delay before launching towardthe International Space Station after a gas leak thwarted their plannedSaturday morning liftoff. 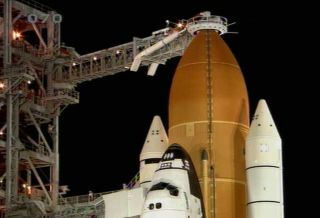 The gaseoushydrogen leak was discovered before midnight while the shuttle's fuel tank wasloading in preparation for Endeavour's plannedlaunch today from Pad 39A here at NASA's Kennedy Space Center at 7:17 a.m.EDT (1117 GMT). The shuttle's astronaut crew had not yet donned theirNASA-issue pressure suits or boarded the spacecraft for their marathon 16-day stationconstruction flight. NASA officially cancelled today's launch plans at12:26 a.m. EDT (0426 GMT). It willtake at least four days to ready Endeavour for a second launch attempt. At thatpoint, the schedule conflicts with the planned launch of two unmanned lunarspacecraft due to lift off toward the moon on June 17 from the nearby CapeCanaveral Air Force Station. Managers for the two missions will have to meet todiscuss which flight should go first. "Wehaven?t even begun to work that out," said Mike Moses, mission managementteam chair, today at a briefing here. "We'll start those negotiationstomorrow and see where we get." IfEndeavour is unable to launch before June 20, it must stand down until July 11,when the space station is again in the right alignment. A similarleak thwarted the space shuttle Discovery's STS-119 launch in March, thoughthat issue was eventually fixed and the shuttle launched successfully. "Thesituation was almost identical to what we had two flows ago," shuttlelaunch director Mike Leinbach said. "It was discovered at almostidentically the same time. It was eerily the same." NASA doesnot launch space shuttles with any known gas leaks at the pad because theextremely flammable gas can cause an explosion during liftoff if it ignites. "Hydrogenis a very volatile commodity," Leinbach said. "It's a commodity you justdon't mess with." Discovery'sSTS-119 flight was ultimately able to launch four days later than planned afterground crews swapped out the seal to a vent line that was carrying the gaseoushydrogen away from the shuttle. The switch fixed the issue, though no rootcause was ultimately determined for the fault in the seal. "Theynever found a smoking gun for it," NASA spokesman Allard Beutel said. Weatherforecasts predicted a pristine 90 percent chance of good flight conditions fortoday's launch attempt. Commandedby veteran shuttle flyer Mark Polansky, Endeavour's seven-astronaut crew willlaunch toward the International Space Station carrying a Japanese-builtporch for the outpost's massive Kibo laboratory. The mission will alsoferry rookie NASA astronaut Tom Kopra to the station to replace Japaneseastronaut Koichi Wakata, who has lived aboard the orbiting lab since lateMarch. Wakata is Japan's first long-duration astronaut and has watched over hiscountry's $1 billion Kibo laboratory at the station. Set tolaunch spaceward aboard Endeavour with Polansky and Kopra are STS-127 pilotDoug Hurley and mission specialists Chris Cassidy, Julie Payette, Tom Marshburnand Dave Wolf. Payette represents the Canadian Space Agency, while the rest areNASA astronauts. Five challenging spacewalks and challenging robotic arm workthat will require three space cranes, two on the station and one on Endeavour,are planned. Kopra isbeginning a three-month mission to the space station as a flight engineer onthe outpost's six-man Expedition 20 crew. He will join two Russians, anotherAmerican and astronauts from Belgium and Canada on what is the station's firstfull six-person crew. Endeavour'smission will mark NASA's third shuttle flight of the year and the second spacestation construction flight of 2009. A May space shuttle mission aboardAtlantis flew astronauts to the Hubble Space Telescope to perform a successfulfinal overhaul. SPACE.comis providing continuous coverage of STS-127 with reporter Clara Moskowitz atCape Canaveral and senior editor Tariq Malik in New York. Click here for missionupdates and SPACE.com's live NASA TV video feed. New Video - Recycled Space Urine, Drink Up!